Chief Plasse received his B.S. in criminology from Indiana State University. He has been a member of the Terre Haute Police Department for 31 years. He was promoted to sergeant in 1998 and lieutenant in 2001; he was appointed to chief of police in 2008. He was honored as The Exchange Club of Terre Haute Officer of the Year in 2001 and First Financial Bank Officer of the Year in 2003. He has received numerous additional awards and medals. He is past president of the Fraternal Order of Police Lodge 85. 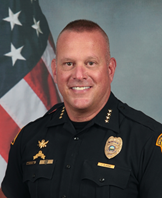 Chief Plasse is also a sergeant major with the 38th Infantry Division in the Indiana Army National Guard in which he has served for 33 years. He was deployed to Afghanistan twice and was recently deployed to Guantanamo Bay Cuba from December 2015 to September 2016. He is a member of the All-Guard International Combat Shooting Team. Several awards he has acquired include the Bronze Star Medal, Defense Meritorious Service Medal, Army Commendation Medal, Army Achievement Medal, and National Defense Medal. These are just a few of the many medals he has been awarded. He also has the Distinguished Rifleman Badge and Distinguished Pistol Shot Badge. He is a member of several organizations: United Way, Boys and Girls Club, VFW Post 972, American Legion Post 104, AMVETS and Fraternal Order of Police (past president).